The radical journalist, George Seldes, established the In Fact political newsletter in 1940. One of the first articles published in the newsletter concerned the link between cigarette smoking and cancer. 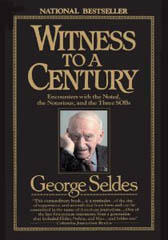 Seldes later explained that at the time, "The tobacco stories were suppressed by every major newspaper. For ten years we pounded on tobacco as being one of the only legal poisons you could buy in America." In Fact often published articles by journalists whose own editors would not use in case they upset their advertisers. At its peak, the newsletter had a circulation of 176,000. This was higher than more established liberal journals such as The Nation and The New Republic. The In Fact newsletter ceased publication in 1950. Question: Can you trust the press? George Seldes: The baseball scores are always correct (except for a typographical error now and then). The stock market tables are correct (within the same limitation). But when it comes to news which will affect you, your daily life, your job, your relation to other peoples, your thinking on economic and social problems, and, more important today, your going to war and risking your life for a great ideal, then you cannot trust about 98 percent (or perhaps 99 1/2 percent) of the big newspaper and big magazine press of America. Question: But why can't you trust the press? George Seldes: Because it has become big business. The big city press and the big magazines have become commercialized, or big business organizations, run with no other motive than profit for owner or stockholder (although hypocritically still maintaining the old American tradition of guiding and enlightening the people). The big press cannot exist a day without advertising. Advertising means money from big business.